These days, elderly technology continues to grow by leaps and bounds, offering individuals enhanced communication and convenience. However, technology today has also embraced quality of life issues and offers seniors multiple technologies that help ensure safe and comfortable environments as well as those that help relieve some worry from the shoulders of caregivers. Medical alert devices, also known as personal emergency response systems, enable seniors to contact and request assistance in emergency situations from a variety of monitoring centers. These assistive technologies are designed to help seniors who live alone at home, as well as individuals suffering from physical limitations or abilities and those recovering in rehab facilities or hospitals. Many medical alarm systems today are geared to those with visual or auditory dysfunctions or limitations. Some of these systems are specially designed for the blind, and incorporate Braille characters into monitors and devices. Medical alert systems utilize a variety of designs that offer simplicity of use and distinct appearances for those with poor vision or hand-eye coordination skills. Most medical alert systems connect to telephone lines and offer pre-programmed telephone numbers that automatically dial out to emergency monitoring centers. Medical alarm systems utilize built-in speakers as well as two-way voice modules that offer communication without having to be on the phone. This type of system is essential and provides a great deal of security for individuals afraid they might fall and be unable to reach the telephone. How does a medical alert system work? The system is easy to use and requires an individual to merely press a personal help button that can be carried around the neck or by pressing an emergency button located on the medical alert system console. These help buttons initiate direct communication with a medical monitoring center and automatically notify emergency responders. Such systems may also be programmed to notify neighbors, family, or friends that have been designated by the individual utilizing the device. Medical alert devices are essential for individuals or caregivers concerned that an elderly parent may fall, slip, or suffer a heart attack or stroke that will render him or her unable to get to a phone. 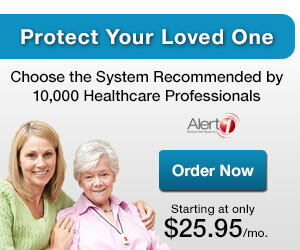 Such alert systems enable many seniors to remain at home in a safe and secure environment. The Internet offers users the ability to engage in online shopping and communication with other family members and social groups that reduces isolation and loneliness in many seniors. Cell phones are also a modern form of elderly technology that enables an individual to be in contact with family, friends, and caregivers literally 24 hours a day. Cell phones are inexpensive and convenient methods of communication and can be carried in a pocket or situated at the bedside 24/7. Video cameras and web cam and computer technology enables active virtual environments in which seniors and caregivers or other family members located in different areas of the house or in different cities can monitor movement as well as relieve loneliness in a multitude of virtual interactions. For example, one common use of such assistive technology is to place a web cam or video camera and computer monitors in the kitchen of a senior or elderly parent and another camera in the home of children or caregivers. This system enables family members to virtually sit down together for dinner or for evening chats. The Center for Aging Services Technologies www.agingtech.org is one of many websites that offer examples of 21st-century technology including walkers that monitor gait and balance to those that utilize the benefits of communication devices for help in monitoring individuals in different areas of a home or care setting environment. Technology will continue to advance, so it makes sense to take advantage of aspects of such assistive technology to make seniors safer, more comfortable, and to give children of aging parents as well as caregivers relief from anxiety or worry. Seniors who wish to stay at home as long as possible are encouraged to embrace elderly technology to enjoy the benefits that such technology offers, not only in personal security and comfort, but for a greater sense of peace and well-being. Safety alarms, personal notification devices, cell phones, and computer web cams, games for seniors and video technology offer ample sources of instant virtual communication with family members and medical care providers as well as help relieve feelings of isolation and depression in many seniors. Log onto the Internet and research technology for seniors or visit your local computer or communications store and you'll more than likely be surprised at the wealth of potential opportunities for enhanced safety and communication you can find. Technology is here to stay, so use it to increase and enhance quality of life, self-confidence and independence. Do You Use Assistive Technologies such as Wearable Technology to Help you Elderly Parents?